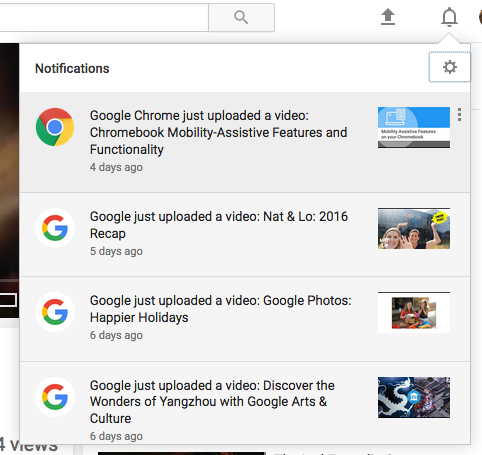 The settings button sends you to the Notifications section from YouTube's Settings page and the 3-dot icon next to each notification lets you turn off notifications from the corresponding channel. If you don't like this experiment, you can always clear cookies for youtube.com in your browser's settings and opt out. 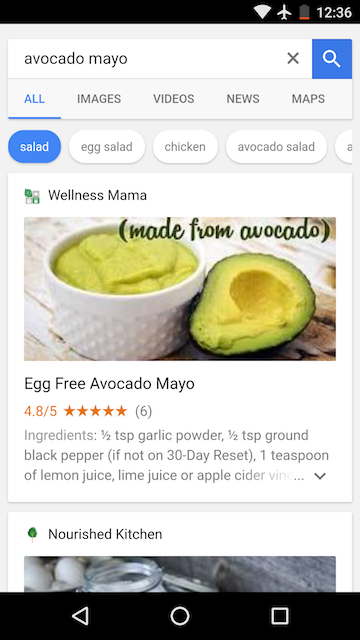 Just in time for New Year's dinner, Google has a new mobile interface for recipe search. 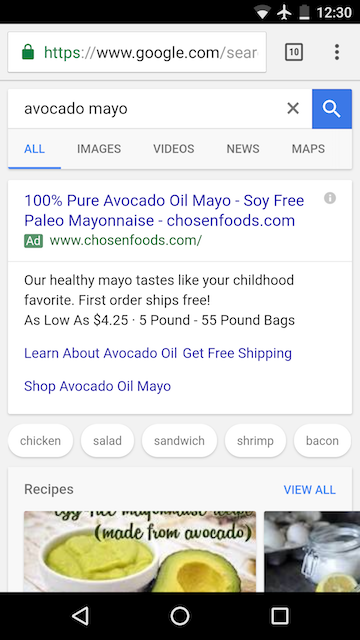 I searched for [avocado mayo] and noticed a long list of keywords below the search box and ads: salad, chicken, shrimp, vegan, bacon and more. 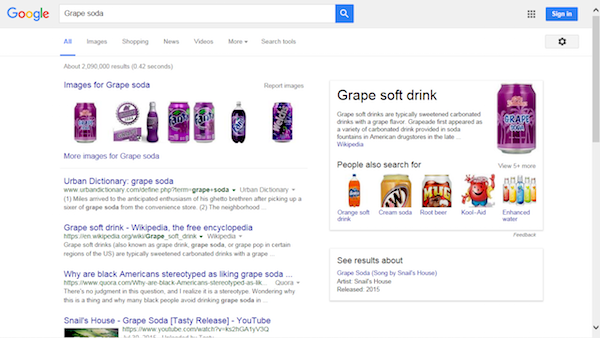 You can select more than one keyword and this helps you refine the results. 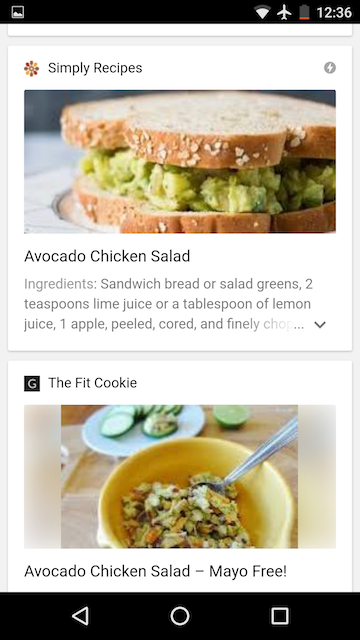 When selecting a related search, you get a completely different interface that only shows recipes: bigger expandable cards, bigger thumbnails, infinite scrolling. 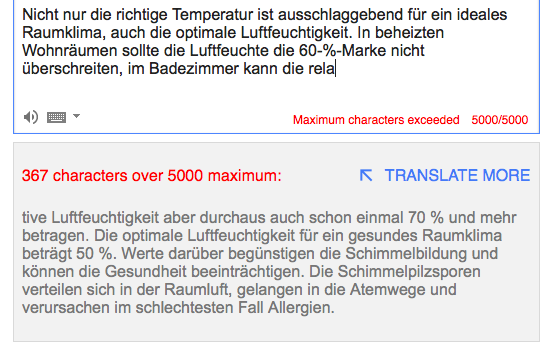 For some reason, Google Translate now has a limit of 5000 characters per translation. There's even a character counter at the bottom of the input box. If you happen to paste a long text that has more than 5000 characters, you'll get an error message ("maximum characters exceeded: X characters over 5000 maximum") and a "translate more" option that lets you translate the rest of the text. I don't understand the purpose of this restriction, considering that Google doesn't impose any limitation when translating web pages. 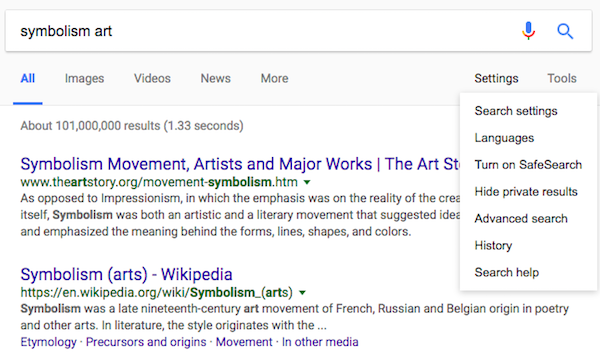 It's worth pointing out that Google Translate's API has a similar limitation: "the maximum size of each text to be translated is 5000 characters, not including any HTML tags". 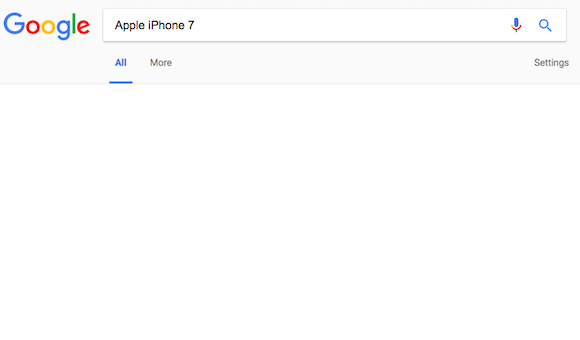 Google's translation card from Google Search has a different limit: about 2800 characters. 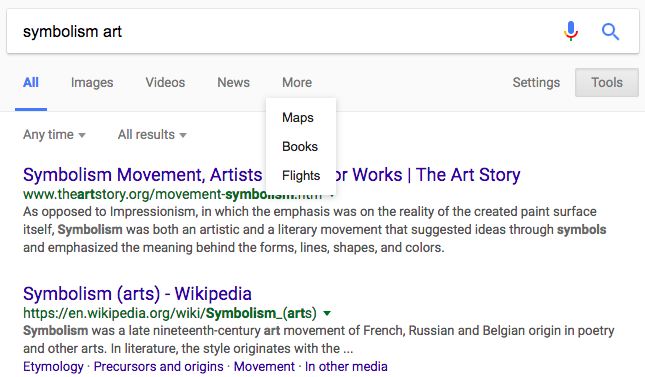 Google's knowledge graph card tests a feature that lets you like or dislike movies and TV shows. 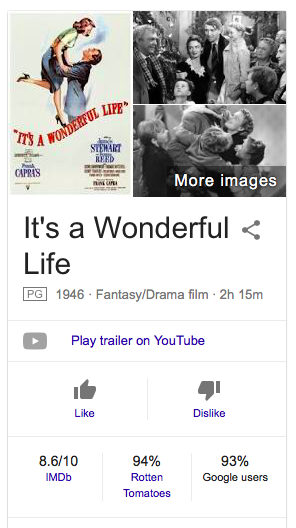 For example, when you search for "It's a Wonderful Life", you can click like or dislike and check the percentage of Google users who liked it. The same buttons show up when you search for a TV show like "Saturday Night Live". 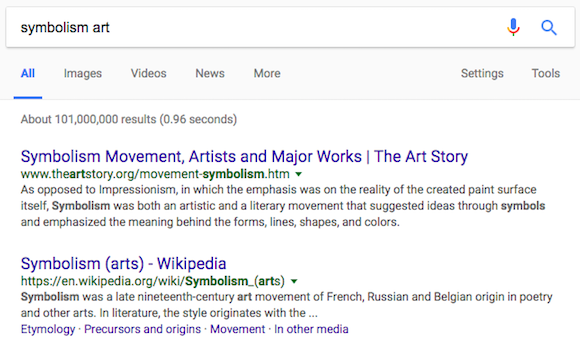 Search Engine Land reports that Google confirmed this experiment, which was first spotted last month. 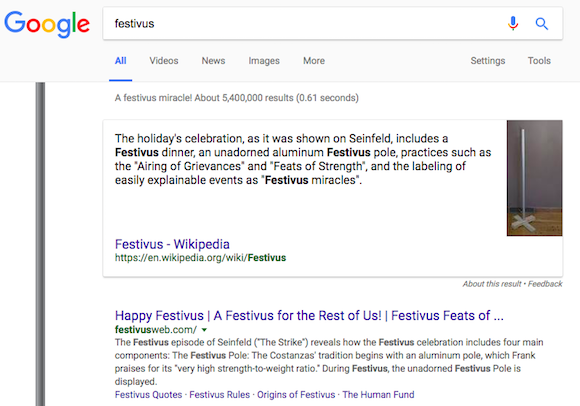 When you search Google for [Christmas], [Hanukkah], [Kwanzaa], [Festivus] or other related queries, you'll see some special decorations related to each holiday. Festivus is "a holiday celebrated by those seeking an alternative to the commercialism and pressures of the Christmas holiday season." 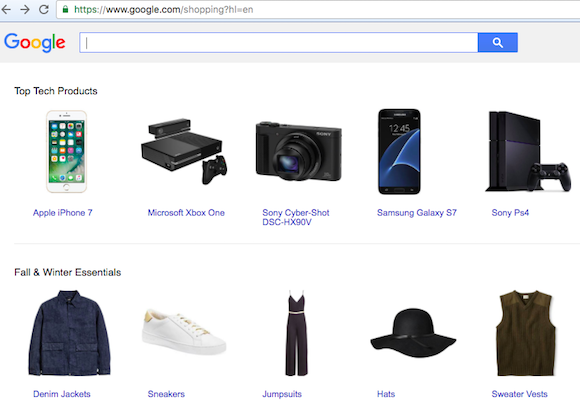 Christmas trees, Santa Claus, the Christmas star adorn the Google search page and bring the hoiday spirit. 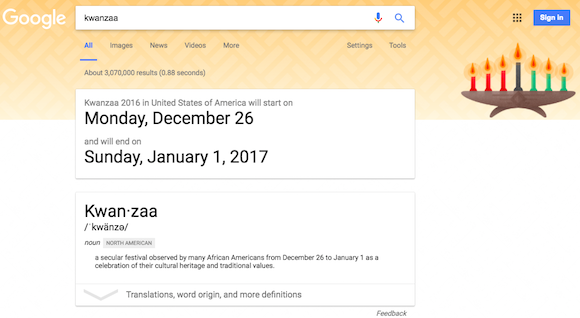 The Hanukkah menorah and Kwanzaa's Mishumaa Saba (The Seven Candles) are lighting up Google's search pages. Here are the decorations from 2015, 2014, 2013, 2012 and 2011.